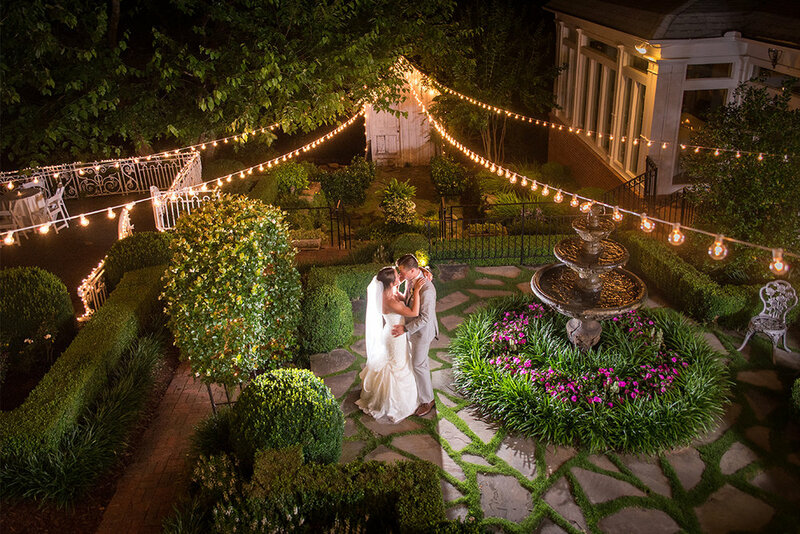 Magic Moments owns and operates six award-winning Atlanta wedding venues and special event venues: Flint Hill and The Atrium in Norcross, Primrose Cottage in Roswell, Little Gardens in Lawrenceville, Cloverleaf Farm just outside of Athens, and our newest addition, Vinewood Stables in Newnan. A Divine Event, a division of Magic Moments, supplies all the event services for these premier properties including catering, floral design, decor and event planning. One of these six exquisite Atlanta wedding venues is sure to fit the bill for the atmosphere you’re dreaming of for your special event. Whether it’s a romantic garden party, picturesque rustic farm wedding or a regal Southern affair, our venues are truly transcendent. We believe our venues are among some of the best Athens area and Atlanta wedding venues. Enchanting Colonial Estate in Lawrenceville, GA.
Little Gardens is a colonial style special event venue burrowed in the midst of a 3-acre estate in Lawrenceville, Georgia. This beautiful estate offers an enchanted outdoor ceremony area, as well as a beautifully designed ballroom. Historic Antebellum in Roswell, GA. This three-story home is situated on a stately front lawn in Historic Roswell that is hidden from the world. A true escape to yesteryear, Primrose Cottage offers luscious gardens surrounding the home and an alluring ballroom located in the midst of a serene environment. Rustic Southern on the outskirts of Athens, GA.
Cloverleaf Farm is a place that allows time for a little poetic reflection. A uniquely picturesque farmhouse encased by a wrap around porch sitting atop acres of gorgeous pastures, groves and gardens awaits the bride who chooses this Southern gem. Neoclassical Garden Party in Historic Norcross. A secret garden tucked away in charming historic Norcross offers a private retreat to all who enter. The Atrium is a stunning two-story glass ballroom with rich Neoclassical design surrounded by flowering shrubs and towering, lush greenery. Contemporary Southern Charm in Newnan, GA. This Georgia plantation house and historic horse barn have been fully renovated to include all of the contemporary amenities you need without sacrificing any of the Southern tradition and charm that you desire.